A small but high-quality offering of Charolais bulls saw a high of 3,500gns at the South West Charolais Association’s annual sale at Holsworthy on Wednesday 12th April, where bulls averaged £2,934 with three more sold than last year. 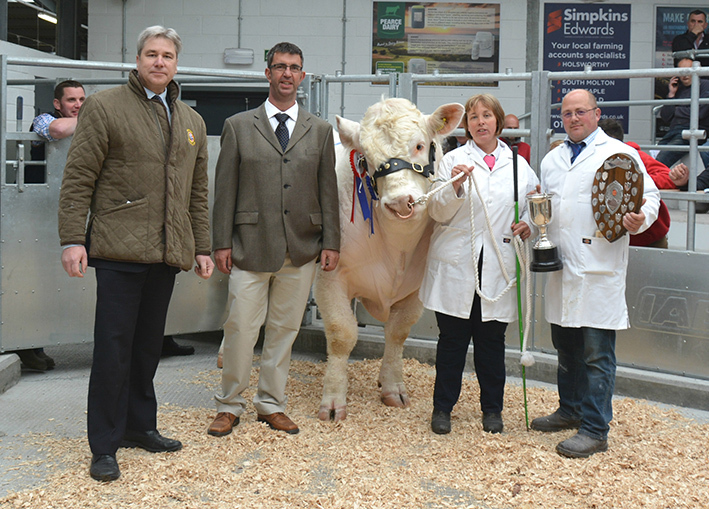 Bidding peaked at 3,500gns for the pre-sale show champion Polgoda Legend from David and Bernadette Stacey, St Austell, Cornwall. 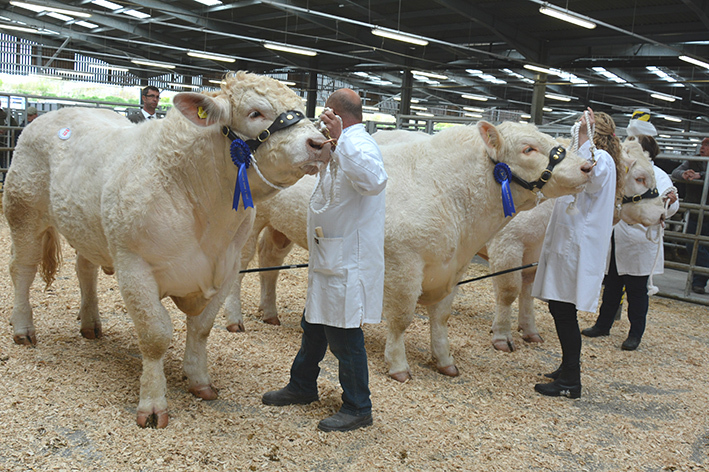 The 15-month-old Legend is bred from a good show line being sired by the Royal Cornwall Show breed champion Balbithan Eria and out of homebred Polgoda Glamoupuss, herself a Royal Cornwall show class winner and he stays local in Bugle, Cornwall going home with HJ Trudgian and Partners. 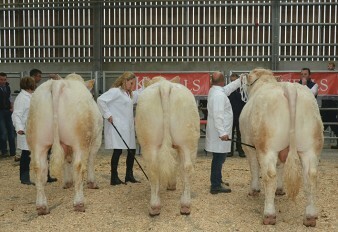 Just behind at 3,200gns was the reserve champion from Mr and Mrs Andrew White, Swanage, Dorset. 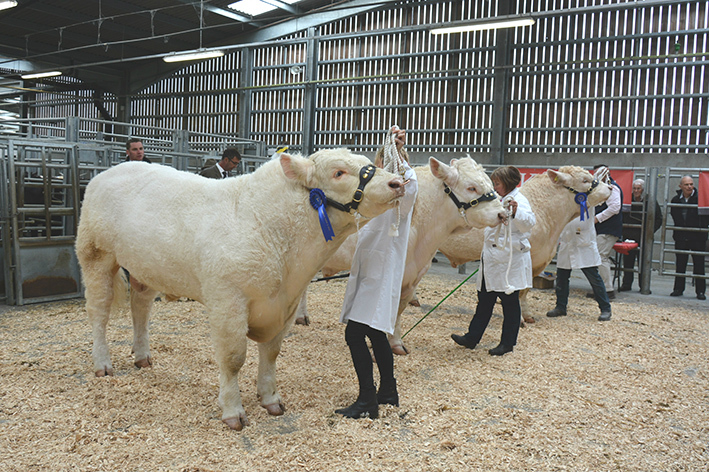 Balbithan Mustang is another with show success in his pedigree as his homebred dam Balbithan Flora goes back to the 12,000gns Devon County Show champion Newhouse Benson and he is sired by the 11,500gns Loganbar Goran. 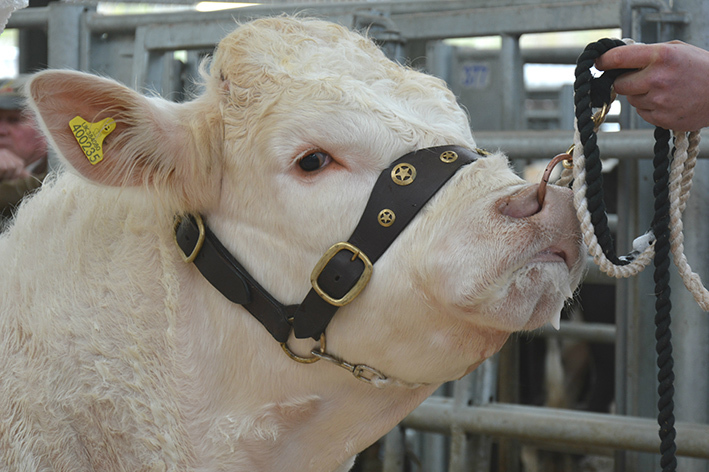 This January-2016-born lad caught the eye of GHJ Medland, Peter Tavy, Devon. 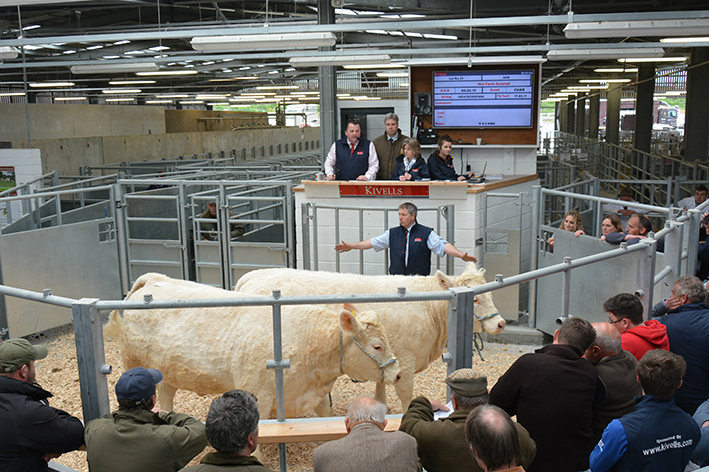 Mr Medland was in a buying mood and went on to purchase two more including the first of three to sell for a 3,000gns price tag. Lovistone Leicester who stood third in his class at the pre-sale show is a 15-month-old sired by Balthayock Hamish and was bred and exhibited by Brian Nancekivell, Okehampton, Devon. Another selling for the same price, from the same home and from the same sire was the November-2015-born Lovistone Leonard, this time out of homebred dam Lovistone Illusive going back to the proven easy calving and short gestation Blelack Digger. 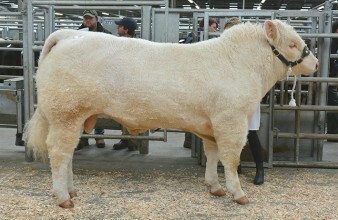 Leonard was purchased by AJ and DM Finnemore and Son, Advent, Cornwall. The final bull to sell for 3,000gns was exhibited by Will Palmer and Son, Truro, Cornwall and was knocked down to A Crane, Kedworthy, Devon. 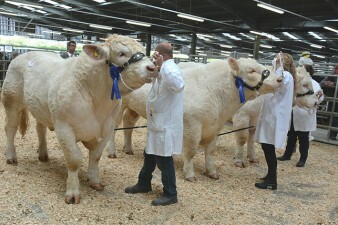 The 23-month-old Springfarm Eldon son Trenestrall Lazie who had been tapped out second in his class earlier in the day by judge John Wylde. 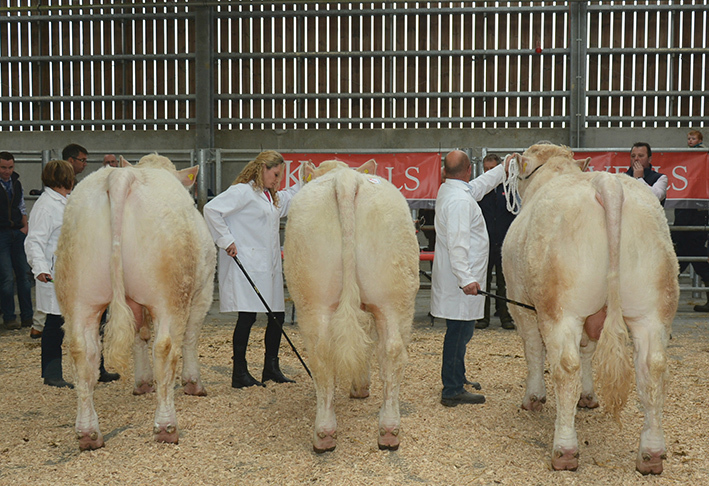 There were just two heifers forward both exhibited by Jane Haw on behalf of Dorset breeders Mr and Mrs Andrew White and sired by the 11,500gns Loganbar Goran. 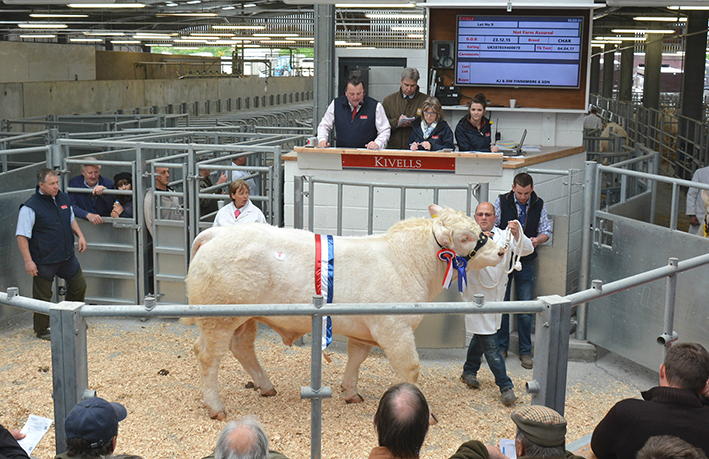 First to sell was the 23-month-old Balbithan Lavender which was purchased by DT Daniel, North Petherwin, Cornwall for 1,550gns. Then moments later Mr Daniel snapped up the slighter younger 22-month-old Balbithan Lenor for the same price.